"We’ve been fighting this idea that cleantech is all about energy." Cleantech isn't all about energy. That was the take-home message at the unveiling of the Cleantech Group’s 10th annual Global Cleantech 100 list this week in San Francisco. “Each year, we make an attempt to read the market’s view around the world of who are the companies that seem to have the best probability of having significant impact in the five- to 10-year timeframe,” said Cleantech Group CEO Richard Youngman at the opening session of the Cleantech Forum. This year, agriculture and food companies claimed a dozen spots on the list. Transportation and logistics companies also had a strong showing, claiming 21 slots in the 2019 cohort. “One of the key stories is the emergence of that in our portfolio over the last 10 years,” observed Youngman. Over the first seven years of the list, he said, agriculture and food companies typically held just two or three slots each year. The 100 companies on the 2019 list are organized into six sectors: agriculture and food; energy and power; industrial and manufacturing; materials and chemicals; resources and environment; and transportation and logistics. Energy and power remained the largest category, with 40 companies represented. Honors went to many familiar names, including Advanced Microgrid Solutions, Freewire, LO3 Energy and Stem. The companies were selected from an initial list of 13,900 nominations from 93 countries. To be eligible for Global Cleantech 100 consideration, nominees must be independent, for-profit companies not listed on any major stock exchange. Cleantech Group, a San Francisco-based consultancy, used its own research as well as third-party data to winnow the initial nominees down to a shortlist of 300 companies. A global 87-member expert panel helped to cull the list of finalists. How has the market shifted since the first Global Cleantech 100 was released? “Our tenth edition is dominated by innovations for the future of food and mobility, and a decentralized and digitized future — not only for energy, but for the industrial world more generally. This is a far cry from the dominance of hardware, solar and biofuels in the inaugural Global Cleantech 100 in 2009,” said Youngman in a statement. The rise in prominence of agriculture, food and mobility on the list was also reflected in the companies selected for additional recognition with special awards. The “Company of the Year: North America” honors went to Impossible Foods, the Redwood City, California-based creator of the plant-based Impossible Burger. “What is heartening to see is this is the first time it was won by a...non-energy company,” said Youngman. The “Company of the Year: Europe and Israel” honors went to Bestmile, a Switzerland-based developer of a fleet management platform for autonomous vehicles, and the “Company of the Year: Asia-Pacific” prize was awarded to Cnano Technology, a maker of multi-walled carbon nanotubes based in China. Other award honorees were: “Rising Star of the Year,” San Francisco-based Volta Charging, an ad-supported EV charging service provider; “Early-Stage Company of the Year,” Apeel Sciences, a California-based developer of organic food coatings; and “Graduate of the Year,” nuTonomy, a Massachusetts-based developer of software for self-driving cars. Apeel Sciences specializes in “using food to protect food,” said Michelle Masek, head of marketing. The company’s current obsession, she said, is the peel. It adds a thin barrier of plant-based material to the surface of fresh produce, which slows down water loss and oxidation. “You can’t see the barrier. You can’t taste it. It’s measured [in] nanometers. It’s an incredibly small amount of plant material,” said Masek. 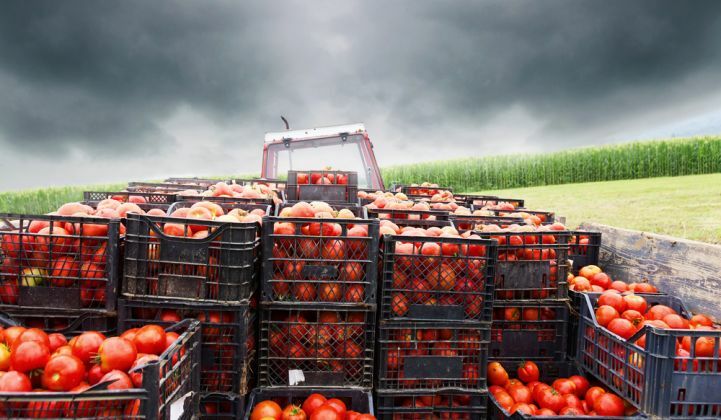 The result, according the company, is a doubling or tripling of shelf life, giving produce more time to travel through the supply chain to reach the customer. Apeel’s avocados are on the market today, primarily via partners in the Midwest. Apeel plans to release lemons and limes next, with asparagus and stone fruits to follow later this year.